3. Mask of choice. I used Mask # 5 by Doris at Scraps Dimensions which may not be available any longer. 4. Alien skin Xenofex - burnt edges. A. Drop shadow: Vertical 2, horizontal 1, opacity 100, blur 4.00, color black. B. Burnt edges settings for paper : Contract 0, burn width 9.35, roughness 1. Leave all other settings unchanged. If you do not have xenofex and would like the burnt edges for this paper, email me and I will be happy to do it for you ! 1. Open a new file in PSP 600 x 600 pixels. Tick the transparent box. Change f/g and b/g colors on materials palette to : #816f2f. Flood fill new file . Open mask # 5 by Scraps Dimensions. Layers> new mask layer> from image. Copy and paste new image onto flood filled file " as new layer" > layers > merge visible. Delete original mask. 2. Open chicken wire from kit. Copy and paste onto tag " as new layer" > layers> merge visible. 3. Openbrown corrugated scrap paper from kit. I used burnt edges filter by xenofex for this , or use burnt edges filter of choice. See *Hints* above. Copy and paste paper onto tag " as new selection" and position as shown , centered and about 6 blocks from top of file/tag. Selections> select none. 4. Open blue ribbon from kit. Image > resize to 85% twice. Adjust > sharpen. Copy and paste onto tag " as new selection" and position to slightly overlap bottom of brown paper. Effects> 3D effects> drop shadow> selections> select none. 5. Open Saguaro Cactus from kit. Copy and paste onto right side of tag " as new selection" and position as shown in 4th block from top and 4th block from right side of tag. Selections> select none. 6. Open frame 1 and paper 1 from kit. On paper 1, get selection tool and change setting to circle, pull out a circle about two and a half inches round> edit> copy > paste as new image. set to the side. Close paper 1. Open Barbara Jensen tube, select bottom layer and close off all other BJ layers. Highlight bottom layer in in layers palette and copy > paste as new image. Close original BJ tube. Left click on new image of tube and resize to 85 %. Copy and paste onto paper, match bottom edges. Get eraser tube , change eraser setting to circle size 35. ( set BJ tube selection aside for later step) . Remove excess edges from tube. Open a new file in psp, same as step 1. 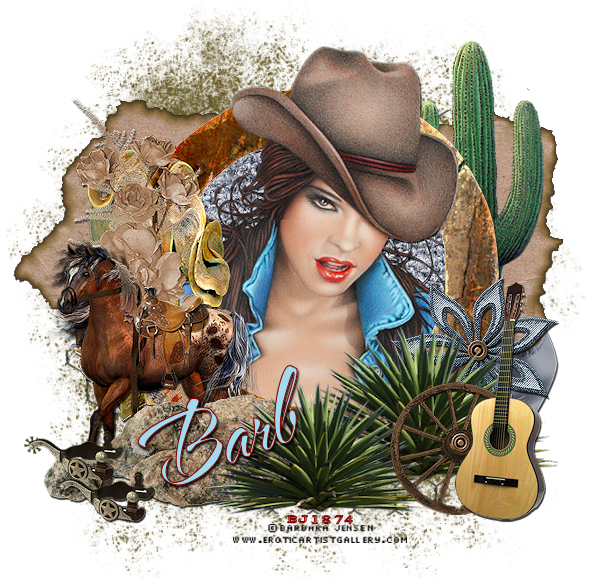 Copy and paste paper with BJ image onto new file " as new layer" > merge visible. Left click on frame 1. Effects>3D effects> drop shadow. Copy and paste frame over top of BJ image " as new selection" and position carefull right over top of tube and paper. Selections> select none. 7. Left click on BJ tube set aside above. Change settings on selection tool to rectangle. Pull out a selection of tube to neck of image> edit > copy > paste over frame " as new selection", and be very careful about matching up edges on tube so that it matches perfectly. Selections> select none. Copy and paste tube and frame onto tag ": as new selection" and position as shown staying between 6th adn 7th block from top of tag and from right side of tag> effects>3D effects. drop shadow> selections> select none. 8. Open horse from kit. Image > resize to 40%. Adjust> sharpen. Open saddle from kit. Image> resize to 20 % . Adjust > sharpen. Copy and paste saddle onto horse, position carefully so that saddle sits down onto horse. Selections> select none. Copy and paste horse and saddle onto left side of tag " as new selection" , position as shown so that nose of horse is aligned with paper edge and tail of horse is aligned with tip of lapel on BJ shirt. Effects> 3D effects> drop shadow> selections> select none. 9. Open flower 2 from kit. Image > resize to 40%. Adjust > sharpen. Copy and paste onto right side of frame " as new selection" , position as shown> selections> select none. 10. Open new file in psp, same as first in step one. Open rock 2 from kit. Image > resize to 40%. Adjust > sharpen. Copy and paste onto new file as new layer> merge visible. Open rock 1 from kit > resize to 30 %. Copy rock and paste " as new selection" onto new file to overlap rock 2> effects> 3D effects> drop shadow> selections> select none. Left click on rock 1 tube again and resize to 85%. Copy and paste as New selection to overlap first two rocks > selections> select none. ( basically you want to make a rock cluster) Copy and paste rock cluster onto left side of tag " as new selection" and position as shown. Effects>3D effects> drop shadow. Selections> select none. 11. Open aloe cactus from kit. Image > resize to 50%. Adjust > sharpen. Copy and paste onto right side of tag " as new selection", position as shown, tips of cactus should touch lapel of shirt and should cover center of blue flower. Effects>3D effects> drop shadow> selections> select none. Left click on cactus tube again > image > resize to 90%. Copy and paste " as new selection" to stagger over first cactus , positon carefully so that it is centered beneath BJ tube chest and overlapping first cactus and rocks . Effects>3D effects> drop shadow. Selections > select none. 12. Open wagon wheel from kit. Resize to 35%. Adjust > sharpen. Copy and paste onto tag > as new selection" , position just under blue flower and over first cactus > effects>3D effects> drop shadow> selections> select none. 13. Open guitar from kit. Image > resize to 40%. Adjust > sharpen. Copy and paste onto left side of tag " as new selection", position over right side of wagon wheel as shown> effects>3D effects> drop shadow. Selections> select none. 14. Open spur from kit. Image > resize to 40%. Adjust >sharpen. Copy and paste onto rocks " as new selection" and position as shown, covering front feet of horse. Left click on spur tube agian and copy and paste " as new selection" to stagger. 15. Left click on tag> image > resize to 90%. Adjust > sharpen. Add proper credits to tag . 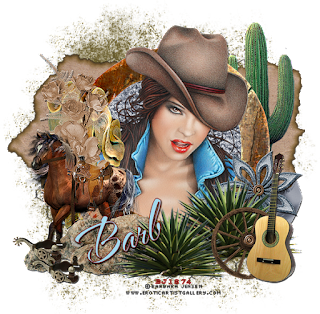 You may add " Scrapkit by BarbieL/ACowgirlsCreations" but its not necessary unless you are a member of my creative team. Thanks for trying my tutorial. This tag and tutorial were created by me , ACowgirlsCreations on 4/23/11. Both are solely my creations. Do not copy, reproduce or claim as your own. Do not post to any website, blog , forum or group without my permission. Do not hotlink this tutorial. Do not translate.